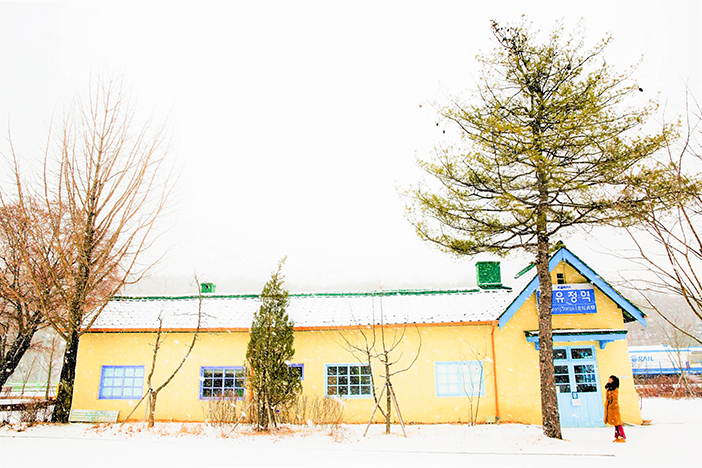 Gangchon offers beautiful scenery throughout the year. 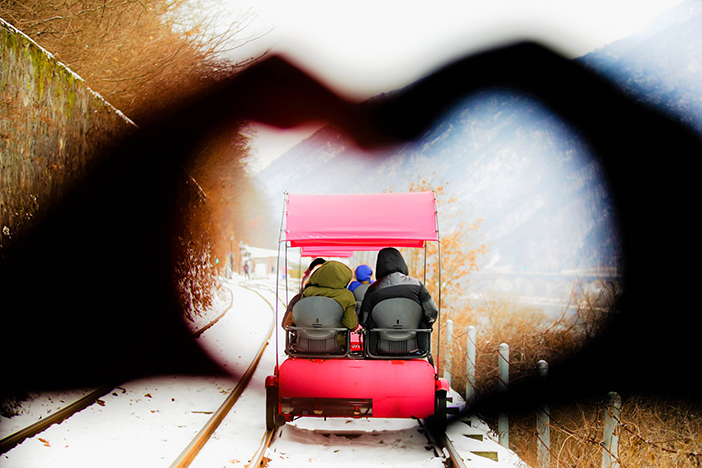 In particular, Gangchon Rail Park provides a way to enjoy fantastic winter scenes without having to trek through the cold, wet snow. 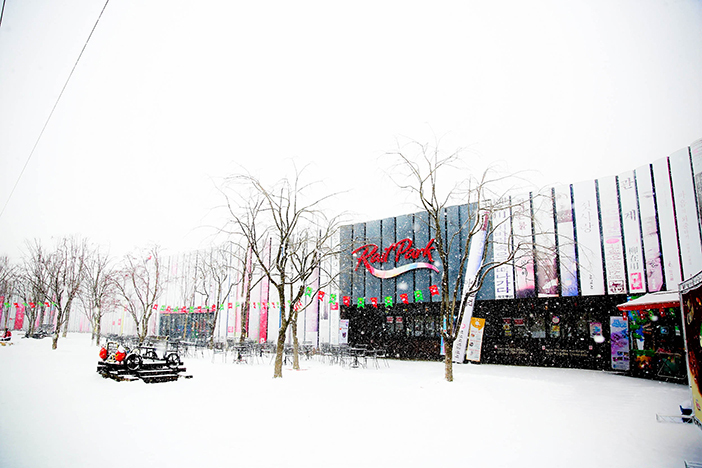 Set on old railroad tracks, this leisure sport park uses the section between Gangchon and Gimyujeong Stations. 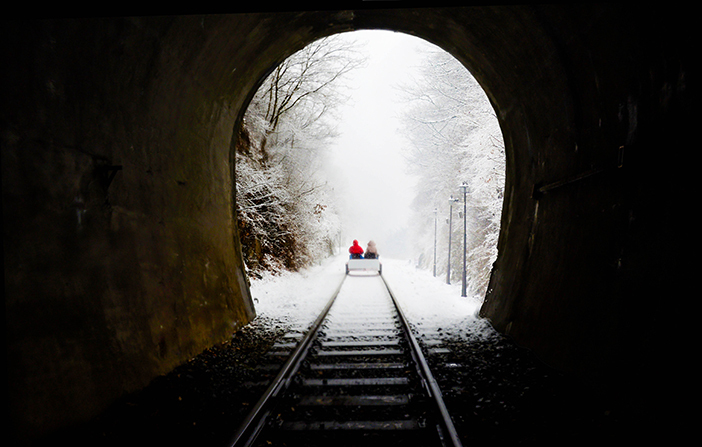 Riding on a rail bike is a romantic outdoor activity to enjoy in winter. You’ll barely feel the cold as you pedal along with someone you love. 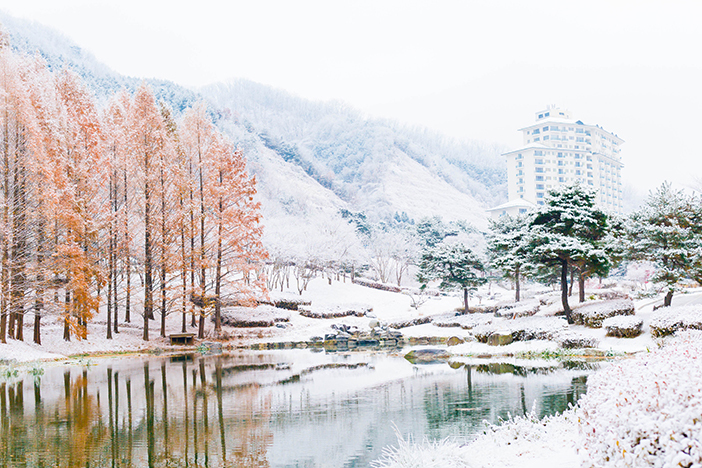 In December and January, the mountains, fields, and river become glazed in sparkling white snow and ice. About halfway along the track, you’ll come across a photo point. Staff are on site to take your picture, which can be printed and placed in a frame for 10,000 won when you arrive at the rest area. Gangchon’s rail bike course covers approximately 8.5 kilometers of track, all on level ground making it easy for all to move at a steady pace while taking in the fantastic surroundings. The first 6 kilometers of track from Gimyujeong Station until the rest area is traversed via rail bike; the remaining 2.5-kilometer-long section to Gangchon Station is completed via the Romantic Train. From here, you can head off to your next destination, or take the free shuttle bus back to Gimyujeong Station. While at the rest area, be sure to buy some warm treats to enjoy and some small crafts or gift items! ☞ Directions: Gimyujeong Station (Gyeongchun Line), Exit 1. Gangchon Rail Park is located to the right. Gimyujeong Station is an old train station located next to the current Gimyujeong Station on the Gyeongchun Metro Line. Rather than letting the station fall into disrepair like many other closed stations, it has been kept up and decorated with cute murals and sculptures, perfect for photo backgrounds. 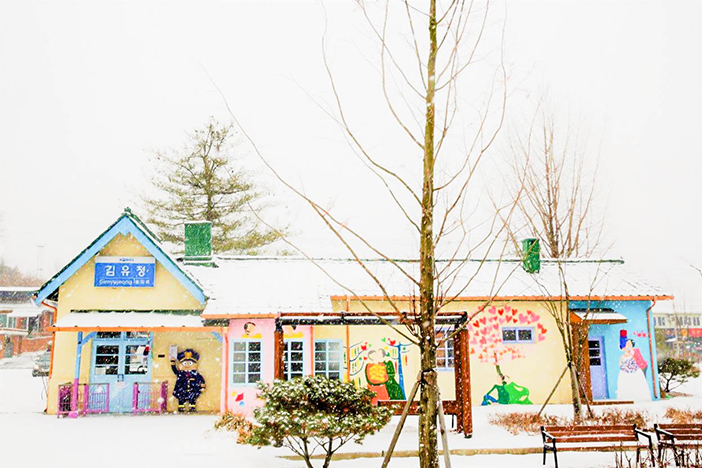 It is especially popular in winter when snow piles up on the rooftop and grounds, making the colorful artwork pop out even more. Old train cars still remain on the train tracks by Gimyujeong Station. In addition to the train cars, the tracks are also decorated with various statues and sculptures that will evoke a sense of wonder. 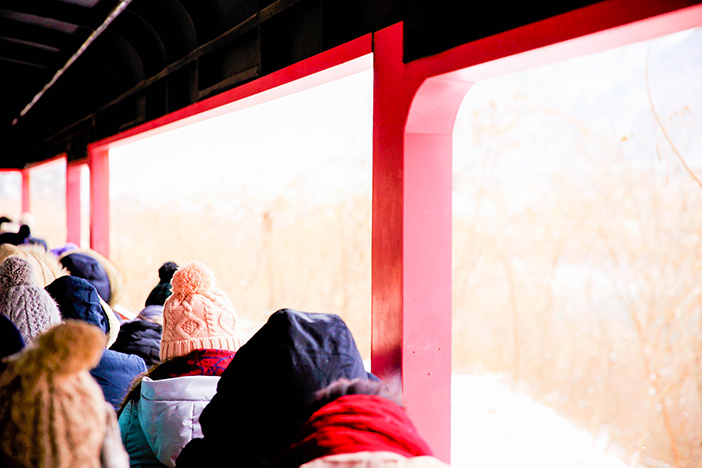 After enjoying the winter landscape, head inside the station or one of the train cars to warm up. The cars have been transformed into spaces for visitors to relax, such as a book café and Chuncheon Tourist Information Center. ☞ Directions: Gimyujeong Station (Gyeongchun Line), Exit 1. Closed Gimyujeong Station is located to the left. Elysian Gangchon is located next to a metro station, making it easily accessible from Seoul. The ski resort has six lifts servicing ten slopes of varying difficulty for beginners as well as intermediate and advanced skiers. Most of the slopes are aimed for people at a lower skill set, allowing everyone to have a good time. Visitors can enjoy the resort’s many leisure activities and facilities while taking in the beautiful natural setting. 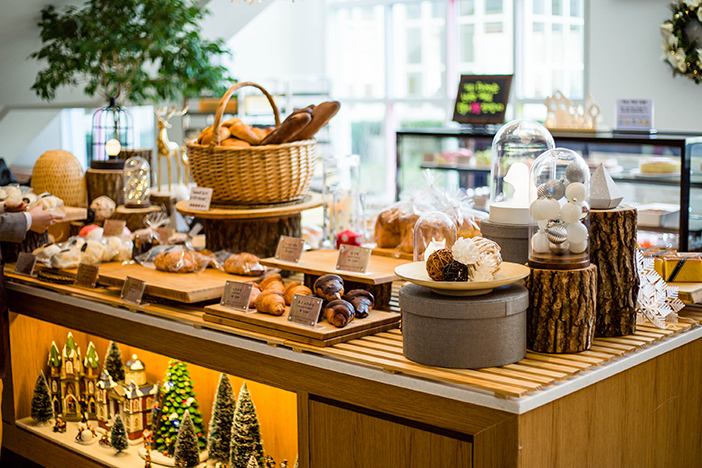 Boutique EL is a bakery serving outstanding baked goods, located on the first floor of the condo at Elysian Gangchon Resort. All items are freshly baked each day, using only organic yeast for a healthy snack. The bakery opens early in the morning, meaning visitors can stop by for a quick breakfast of warm bread and coffee before hitting the slopes. In addition to simple buns and croissants, Boutique EL also sells buns with sweet red bean or cream fillings and cake by the slice. Gangchon vacation: free of worry, full of flavor! When visiting Gangchon, you have to include dakgalbi (spicy stir-fried chicken) on the menu! Hangajok Sutbul Dakgalbi is located within walking distance from Gimyujeong Station, making it the perfect place to stop after working up an appetite on the rail bike. The front garden is also decorated with many small, cute items, making it appear more like an outdoor art gallery than the entrance to a restaurant. Be sure to take some pictures before entering! Dakgalbi, a grilled dish made of chicken marinated in a spicy gochujang (Korean chili paste) seasoning, is famous in the Gangchon and Chuncheon region. This dish can largely be classified into one of two ways, based on the grilling process. Sutbul dakgalbi is made with just chicken meat grilled over a charcoal fire, while many places will serve stir-fried dakgalbi, fried in a large pan with cabbage, sweet potato, and other ingredients. 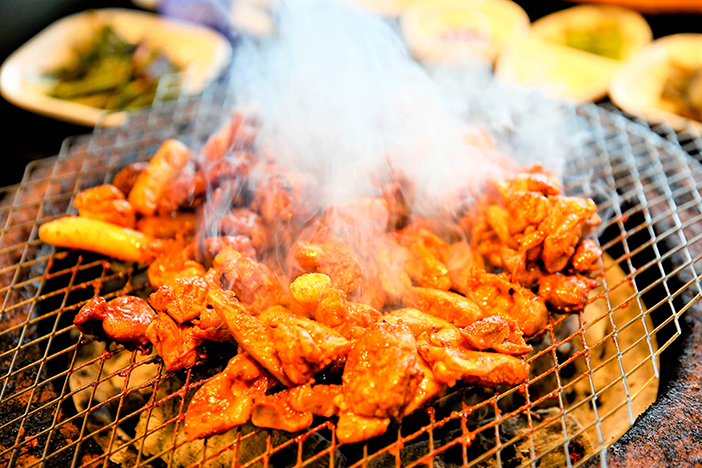 At Hangajok Sutbul Dakgalbi, diners can enjoy the rich, smoky flavoring of meat grilled directly over the fire. The restaurant’s gochujang seasoning is also on the lower end of the spicy scale, so everyone can enjoy dakgalbi, bokkeumbap(fried rice) or makguksu (spicy buckwheat noodles) here. 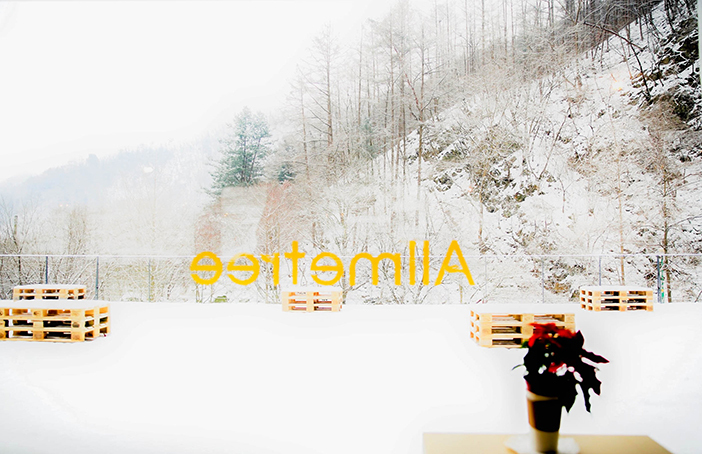 Allmetree is a café in the area of Gangchon Station and Gugokpokpo Falls that is quite popular among travelers. With grand floor-to-ceiling windows on all four sides, every seat provides an opportunity to take in the beautiful scenery outside. In winter, you can enjoy the feeling of a snowy wonderland while keeping warm and cozy indoors. If you’re looking to get even closer to nature, take a seat on the wide terrace in the back of the café. The best way to sweeten the winter cold is by digging into warm desserts. Allmetree serves various coffee drinks, but they are most famous for their sweet choco latte, topped with thick whipped cream. 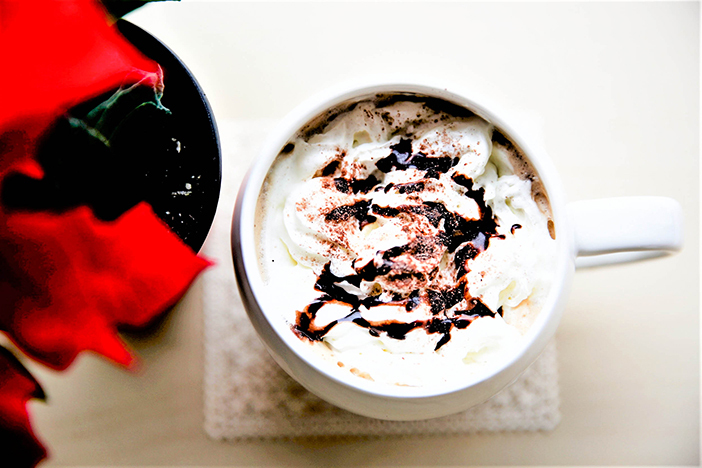 Your temperature will rise with each sip of this rich treat. If you’re looking for something to eat, the café also serves cakes, including raspberry tart and chocolate roll cake. However, for something a bit more unique, order the penguin bread. These cute breads are shaped like adorable little penguins and come in a choice of chocolate or butter flavor. Whichever flavor you choose, you are sure to be pleased; just don’t forget to take a picture beforehand! * This column was last updated in January 2019, and therefore information may differ from what is presented here. We advise you to check details from the official websites before visiting.